Prior to my election as mayor, many expressed having difficulty making cell phone calls from inside their homes or having to go outside to get a signal. Increasingly, residents and visitors resorted to driveways and decks to make and receive cellular calls. The number of complaints at the front desks of the island’s major hotels and conference centers was increasingly related to the lack of cell phone coverage. Previous town councils strictly limited cell towers because of their appearance; but smartphones and tablets became mainstream, and we had to change our approach. Residents and visitors demanded to be plugged in. Town council identified the quality of telecommunications as one of its primary priorities and with council’s support, a citizen created and led a telecommunications taskforce focused on this issue. We worked with this group to form cooperative relationships with decision makers of cell phone companies such as AT&T and Verizon and with others in the telecommunications industry to promote improvements in service. The companies informed us that our permitting took too long and our setback requirements were sometimes so large that sites could not even be located. These standards were appropriate when they were put into place. At that time, the design of towers could have been much more intrusive than the single monopole style used now. Towers were often 200- to 300-feet tall and made of lattice steel structures or with guyed wires stretching hundreds of feet out to each side of a tower as an anchor, all with very large equipment at the base, enclosed by a cyclone fence. Tower designs and engineering have since improved. Now, towers can safely be designed to be disguised like trees or steeples, even palm trees. Therefore, we decided to make expedited LMO amendments, first, to address the critical issues. Recently, we made changes with the LMO rewrite that better facilitate the installation of new infrastructure that is needed to have quality service here. We have also continued work with the telecommunications taskforce to raise awareness of this issue and to promote investment in the island’s infrastructure with these companies. It’s something we always knew. It’s just that more people know it now. Never in my public or personal life in Bluffton have I witnessed the unprecedented good news about our town. Earlier this summer, Larry Toomer (Bluffton councilman), his family and his business, the Bluffton Oyster Factory, were featured in Family Circle magazine. The next month, Southern Living magazine also revealed its 2014 Idea House in Palmetto Bluff, which is expected to bring more than 20,000 people to our area. Following that, Southern Living also awarded the Town of Bluffton its “Best Community Revitalization” for its Wharf Street redevelopment project. Soon after, Huffington Post also named Bluffton number one on its list of “Top 10 Amazing Non-Beach Summer Getaways.” We are honored. To add more force to this media wave, last week a real estate web-based service, Movoto, named Bluffton one of the 10 safest cities in South Carolina. 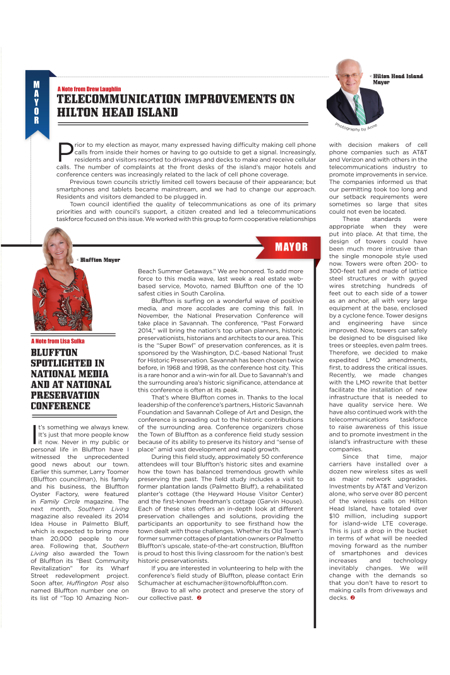 Bluffton is surfing on a wonderful wave of positive media, and more accolades are coming this fall. In November, the National Preservation Conference will take place in Savannah. The conference, “Past Forward 2014,” will bring the nation’s top urban planners, historic preservationists, historians and architects to our area. This is the “Super Bowl” of preservation conferences, as it is sponsored by the Washington, D.C.-based National Trust for Historic Preservation. Savannah has been chosen twice before, in 1968 and 1998, as the conference host city. This is a rare honor and a win-win for all. Due to Savannah’s and the surrounding area’s historic significance, attendance at this conference is often at its peak. That’s where Bluffton comes in. Thanks to the local leadership of the conference’s partners, Historic Savannah Foundation and Savannah College of Art and Design, the conference is spreading out to the historic contributions of the surrounding area. Conference organizers chose the Town of Bluffton as a conference field study session because of its ability to preserve its history and “sense of place” amid vast development and rapid growth. During this field study, approximately 50 conference attendees will tour Bluffton’s historic sites and examine how the town has balanced tremendous growth while preserving the past. The field study includes a visit to former plantation lands (Palmetto Bluff), a rehabilitated planter’s cottage (the Heyward House Visitor Center) and the first-known freedman’s cottage (Garvin House). Each of these sites offers an in-depth look at different preservation challenges and solutions, providing the participants an opportunity to see firsthand how the town dealt with those challenges. Whether its Old Town’s former summer cottages of plantation owners or Palmetto Bluffton’s upscale, state-of-the-art construction, Bluffton is proud to host this living classroom for the nation’s best historic preservationists. If you are interested in volunteering to help with the conference’s field study of Bluffton, please contact Erin Schumacher at eschumacher@townofbluffton.com.